At AF Acoustics we are able to offer a range of vibration monitoring services to suit your requirements from construction and demolition to piling vibration surveys. Construction vibration monitoring can play a major role in protecting surrounding buildings during construction works. Activities that can cause damage on construction sites include: Demolition of existing structures, piling and breaking out of concrete slabs. Our solutions and vibration monitoring systems offer clients peace of mind that the construction works being carried out do not affect the surrounding properties or structures. The vibration monitoring equipment would be installed on site and monitoring can be attended or carried out remotely. We would keep you and your project managers informed of the levels being generated on your site. If there are any exceedances they would be reported immediately and if the monitoring is undertaken remotely, we would arrange for text or email alerts to be set up. We can provide weekly reports sent to your site managers. Demolition vibration monitoring is becoming increasingly common to protect surrounding buildings from the potential excessive vibration levels caused during sheet piling, demolition of structures and heavy vehicle movement on site. Local Authorities often require monitoring to be undertaken before work starts on site in order to establish baseline levels followed by continuous long-term monitoring for the duration of the works. Piles are used to support many types of structures such as buildings and bridges. The installation of piles often creates vibration in the ground which may affect neighbouring properties to the work site. The amount of vibration caused depends on many things such as the type of piling, e.g. 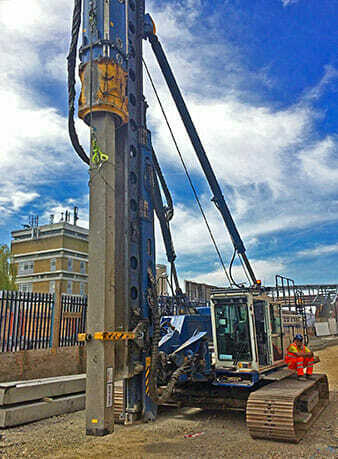 impact piling or vibratory piling. The weight of the ramming equipment, impact velocity, drop heights and the surrounding soil. AF Acoustics can monitor the levels generated from piling installation on surrounding structures and buildings. We can keep Site Managers informed of the vibration levels their works are creating so that they can assess and adjust the method of works to keep vibration levels from reaching critical levels which could lead to damage on neighbouring properties and occupants.